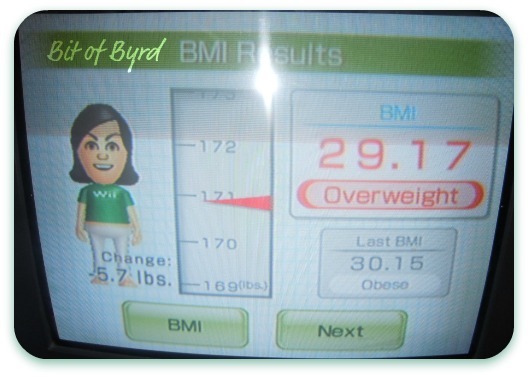 Bit Of Byrd: Byrd is Overweight! YAY! Don't think that just because I haven't continually been posting about this I have fallen off the fitness wagon. Okay, it might have been dragging me alone for the last few days ::cough:: week but the resolve is still there! I have still been trying to eat healthier and eat smaller portions. This is much easier to do during the week when my day is full of time constraints and schedules. The weekend is much more difficult. So if I am still doing this, why not talk about it all the time? Because that leads to blog and fitness burn out. I figured two weeks is a good time frame to check into my progress and share it with you. I think I need to personally do it once a week to keep my motivation up, but the blog only needs it every other. So as in my title... I am now overweight! YAY! Yay? YES! two weeks ago... Wii said I was Obese! So to be overweight and to have met and past my two week goal I was happy. The goal I set was 2lbs in two weeks. I lost about 1 % in my BMI and 5.7 lbs! yay! Drinking a lot of water, half a liter with every meal and snack. For the next two weeks I resolve to make it to the gym 6 times in that two week period.